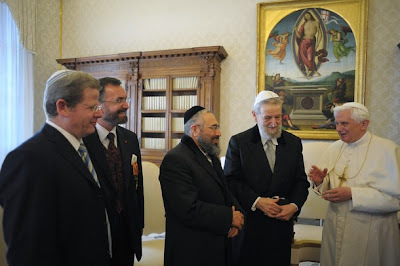 As noted below, alongside this morning's release of the Pope's letter of reflection to the world's bishops on the SSPX de-excommunications and their fallout, B16 held a private audience with a delegation of the Chief Rabbinate of Israel, accompanied by members of the Pontifical Commission for Religious Relations with the Jews. The leaders of Judaism's two major groups in the Holy Land had severed relations with the Holy See in the immediate wake of the late January "remit" for the ultra-traditionalist group. Included in the group was Rabbi Shear-Yashuv Cohen, the chief rabbi of Haifa who became the first Jewish cleric to address a global gathering of bishops at last October's Synod on the Word at the Vatican. It gives me great pleasure to welcome you, the delegation of the Chief Rabbinate of Israel, together with Catholic participants led by the Holy See's Commission for Religious Relations with the Jews. The important dialogue in which you are engaged is a fruit of the historical visit of my beloved predecessor Pope John Paul II to the Holy Land in March 2000. It was his wish to enter into a dialogue with Jewish religious institutions in Israel and his encouragement was decisive to attaining this goal. Receiving the two Chief Rabbis of Israel in January 2004 he called this dialogue a "sign of great hope". During these seven years not only has the friendship between the Commission and the Chief Rabbinate increased, but you have also been able to reflect on important themes which are relevant to the Jewish and Christian traditions alike. Because we recognize a common rich spiritual patrimony a dialogue based on mutual understanding and respect is, as Nostra Aetate (n. 4) recommends, necessary and possible. Working together you have become increasingly aware of the common values which stand at the basis of our respective religious traditions, studying them during the seven meetings held either here in Rome or in Jerusalem. You have reflected on the sanctity of life, family values, social justice and ethical conduct, the importance of the word of God expressed in Holy Scriptures for society and education, the relationship between religious and civil authority and the freedom of religion and conscience. In the common declarations released after every meeting, the views which are rooted in both our respective religious convictions have been highlighted, while the differences of understanding have also been acknowledged. The Church recognizes that the beginnings of her faith are found in the historical divine intervention in the life of the Jewish people and that here our unique relationship has its foundation. The Jewish people, who were chosen as the elected people, communicate to the whole human family, knowledge of and fidelity to the one, unique and true God. Christians gladly acknowledge that their own roots are found in the same self-revelation of God, in which the religious experience of the Jewish people is nourished. As you know, I am preparing to visit the Holy Land as a pilgrim. My intention is to pray especially for the precious gift of unity and peace both within the region and for the worldwide human family. As Psalm 125 brings to mind, God protects his people: "As the mountains are round about Jerusalem, so the Lord is round about his people, from this time forth and for evermore". May my visit also help to deepen the dialogue of the Church with the Jewish people so that Jews and Christians and also Muslims may live in peace and harmony in this Holy Land. I thank you for your visit and I renew my personal commitment to advancing the vision set out for coming generations in the Second Vatican Council's declaration Nostra Aetate. As the pontiff noted, he'll be visiting Israel, Jordan and the Palestinian territories from 8-15 May. At Vatican Darwinfest, Design is the "Delusion"